Chameleon is a new innovative image editing plug-in for Adobe Photoshop, Corel Photo-Paint, Jasc Paint Shop Pro and other digital imaging software that supports third-party plug-ins. It is an ideal tool for anyone who would like to create collages or otherwise experiment with digital images. The plug-in is very easy to handle. You do not have to make precise selection of the copied object and think about how you can make the pasted object look natural in the new environment. Inserting images, changing texture, blending colors, and otherwise altering image is done automatically with a simple "point and click" technique. The software comes with no interface; Chameleon is found in the Effects list of your photo editor and applied accordingly. Examples of what an amateur user can do with Chameleon can be seen at http://akvis.com/en/chameleon/examples-image-combination.php. While the product targets amateur and semi-professional users, it can be employed by skilled designers, digital artists and 3D modelers to do fine work with images or objects, especially the ones who use 3D Max. The plug-in is highly recommended for any individual interested in digital imaging who found Adobe Photoshop or Corel Photo-Paint to be too complicated or difficult to learn. Chameleon is so straightforward that any person with no prior knowledge can master it within a day. AKVIS Chameleon 1.0 is distributed electronically over the Internet; free trial is available at http://AKVIS.com for evaluation and can be used extensively for 10 days. The price of a single copy is 69.00 US Dollars. AKVIS is an independent software developing company specializing in digital image processing software. 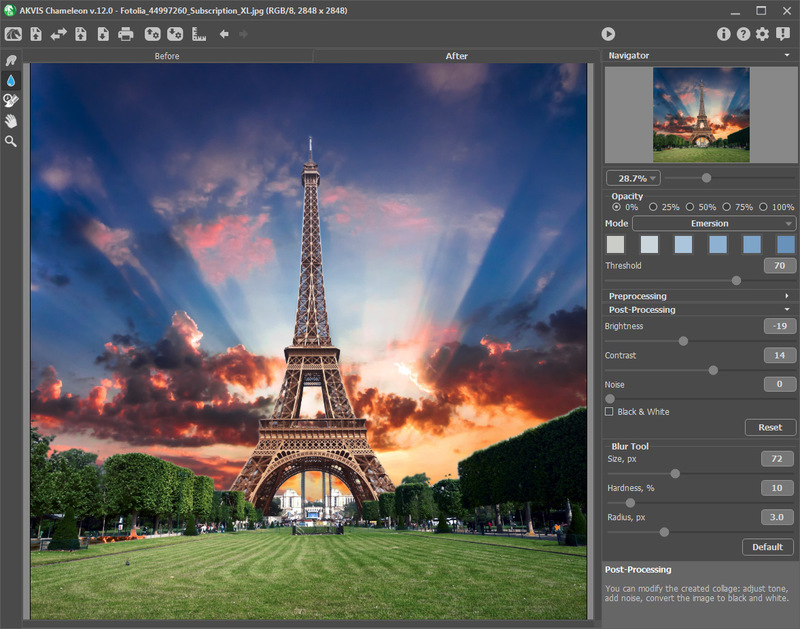 The company is developing a line of unique image edition software application that currently includes AKVIS Retoucher and AKVIS Chameleon. The company offers licenses to non-profit organizations (like heritage foundations and historical societies) involved in photo restoration projects free of charge.